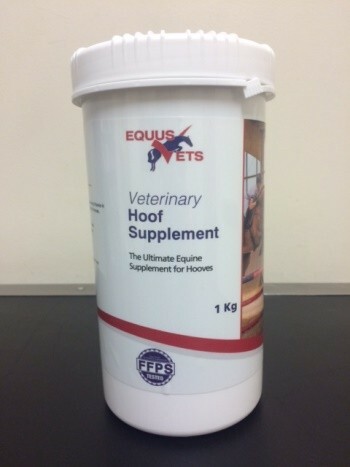 Equus vets hoof supplement provides all the nutrients necessary to protect and nourish every layer within the hoof horn. This sulphur enriched formula will ensure the important nutrients are supplied to the horses diet, to optimise hoof growth and improve integrity of the hoof. It contains a concentrate source of the sulphur rich amino acid methionine and the sulphur rich nutrient MSM. Keratin Sulphate, the structural component of the hoof horn has high sulphur content. It contains a very high level of biotin 37.5mg per daily serving. Ingredients also included are Calcium, essential for cohesion in the hoof wall, zinc which is required for healing for all epidermal tissue and other amino acids which are the building blocks of protein. Horses - feed one 20g scoop per day. Ponies and foals - Feed 20g scoop every other day. Equus Vets Hoof Supplement is competition legal.